Biliary atresia is a potentially life-threatening condition in infants; it is characterized by abnormal openings in the bile ducts inside or outside of the liver. There are two types of biliary atresia: fetal and perinatal. Fetal biliary atresia occurs in a fetus in the womb. Perinatal biliary atresia is more common and becomes apparent approximately 2-4 weeks after an infant's birth. Sometimes birth defects in the heart, intestines, or spleen accompany biliary atresia, especially in the fetal form of the condition. Bile ducts help to remove waste from the liver and carry salts which help the small intestine break down fat. Abnormal bile duct openings cause bile to build up and cause damage in the liver. Liver damage leads may lead to cirrhosis (scarring) and loss of liver tissue. When the liver is unable to function properly, a liver transplant may be the only option for survival. Currently, there is no proven cause for biliary atresia. Biliary atresia is not an inherited disease, and there is no risk of passing it on to a child. Biliary atresia is believed to be triggered by one or more events that occur in the womb near the time of birth or shortly after birth. Experts believe that bacterial infection, viral infection, random genetic mutation, exposure to toxins, or a condition that impairs immune function could contribute to the development of biliary artresia in an infant. Female infants, infants born prematurely, and infants of African or Asian descent have an increased risk for developing biliary atresia. Jaundice ( yellowing of the skin or whites of the eyes) is usually the first symptom. There is no single test to diagnose biliary atresia. 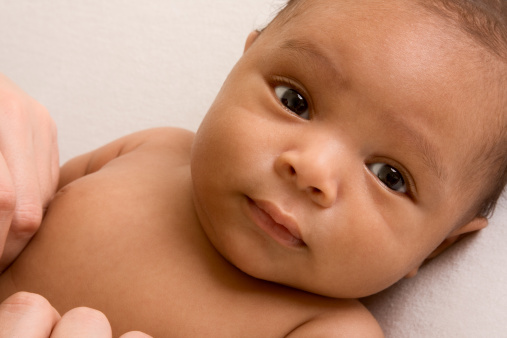 Infants with jaundice and accompanying gray or white stools 2-3 weeks after birth are administered a series of tests. Blood tests are used to check bilirubin levels in the blood. These tests may be accompanied by liver diagnostic imaging tests, such as abdominal X-rays, ultrasound, liver scan. In some cases, a liver biopsy or diagnostic surgery may be performed. Surgery is often the method for treating biliary atresia. In a procedure called Kasai, a surgeon removes the infant's damaged bile ducts and replaces them with a loop of intestine. Bile then flows directly into the intestine. This procedure does not cure biliary atresia, but it can correct bile flow and other related issues. The Kasai procedure is most effective when performed on infants younger than 3 months of age, because infants this young typically do not have significant liver damage. Without surgery, infants affected with biliary atresia are unlikely to live past the age of two. If the Kasai procedure is ineffective, the infant usually requires a liver transplant within 1-2 years. Even with successful Kasai surgery, infants often develop cirrhosis and require transplant by adulthood. Almost all infants in the U.S. who need a transplant will receive one because of progress in transplantation efficiency. In the past, infants had to wait for a compatible liver from another infant for transplant. Now, it is possible to use techniques such as a split-liver transplant or reduced-size transplant using adult livers for transplantation into infants and children. Biliary atresia is considered a rare condition, affecting approximately 1 in 10,000 infants.